A Muslim teacher who shielded Christian fellow passengers when their bus was attacked by Islamist militants has died in surgery to treat his bullet wound. Salah Farah was on a bus travelling through Mandera in Kenya when it was attacked by al-Shabab in December. The attackers told the Muslims and Christians to split up but he was among Muslim passengers who refused. 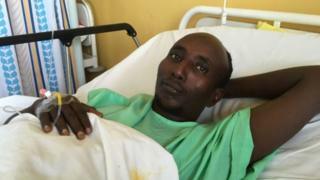 A bullet hit Mr Farah and almost a month on, he died in hospital in the capital, Nairobi. Why is al-Shabab targeting Kenya? In previous attacks in the area, al-Shabab has killed Christians and spared Muslims. At the time, Mr Farah told the BBC's Bashkas Jugsodaay that attackers had offered him an escape. "They told us if you are a Muslim, we are safe. There were some people who were not Muslim. They hid their heads," he said. However, he recalled to Kenya's The Daily Nation that people were told to separate but they refused. "We asked them to kill all of us or leave us alone." Explaining his actions, he told Voice of America earlier this month that "people should live peacefully together". "It's only the religion that is the difference, so I ask my brother Muslims to take care of the Christians so that the Christians also take care of us... and let us help one another and let us live together peacefully". After his death, Inspector General of Police Joseph Boinnet paid tribute to Mr Farah, telling Kenya's Standard Mr Farah was "a true hero". Mr Farah's brother Rashid told Kenya's The Star newspaper he hoped his brother's death would bring religious harmony and encourage Kenyans to live as one community. The meeting in Russia, the first for the two leaders, follows the collapse of Trump-Kim talks.